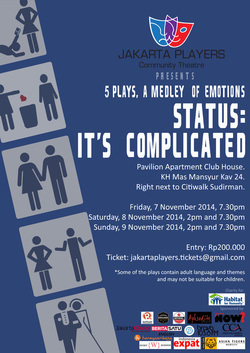 Tickets are on sale for the Jakarta Players's newest production, "Status: It's Complicated"
#SICPlay is one of Jakarta Players's favorite kinds of performances - five short, excellent one act plays in every show - each between 10 and 20 minutes long. As the name suggests, each plays explores a different aspect of romantic relationships in a fascinating and entertaining way. Some of the plays are hilarious, some are touching, and all have something to say! Time Flies by David Ives - Two mayflies out on a date tune in to an episode of "Life on Earth" with David Attenborough and are alarmed at what they discover. The Right to Remain﻿ by Melanie Marnich - Peter returns home after a hard day at the office to find his wife and teenage son will hardly talk to him. What's going on? Mr & Mrs by Julie Marie Myatt - The first dance at a wedding reception serves up a hilarious look at why men marry women and women marry men. Or does it? Check Please by Jonathan Rand - Dating nightmares gone bad. Two singles realize that to find Mr. or Mrs. Right you have to go through a lot of Simply Wrongs. Great comedy. Bricklayers Poet by Joe Maruzzo - A lyrical reflection on the magic of finding true connection with another human being in the city, as seen through the eyes of a bricklayer and a writer who meet in a New York bar. Take your loved ones out and have a great time with us! Grab your tickets now! Thank you for supporting the Jakarta Players, Jakarta's original and longest-running English language theatre group. Every ticket you buy helps us put on good shows -- and build new houses for poor Indonesian families through Habitat for Humanity Indonesia!